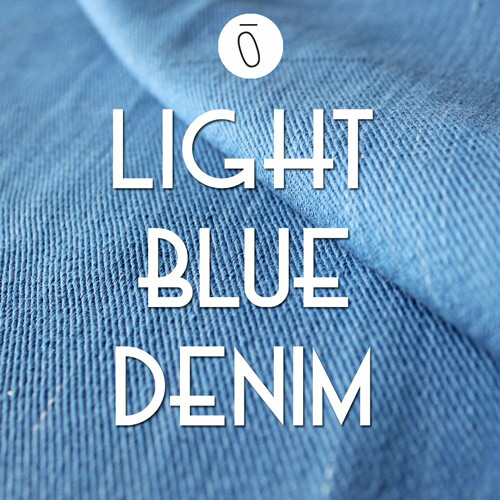 Our #FabricOfTheWeek the gorgeous Light Blue Denim! It’s a truly beautiful fabric with amazing manufacturing background (all hand spun AND hand woven in a Fair Trade certified unit!). I hope the video helps you to see how it moves and drapes. Don’t forget you can watch it in high resolution and full screen: click the “cog” in the corner of the video and click “720”. In high definition you can really see the twill weave and just how many blues make up this beautiful blue denim fabric! The word denim is supposedly derived from the French name “serge de Nimes,” a fabric which originated in Nimes, France during the Middle Ages. The word dungarees is one of only a few mainstream English words to have come from the Indian dialect, Hindi. The source word refers to a type of coarse cloth. As it happens, Hindi inspired some of the names of our own fabrics – Barisa बारिश , for example (pronounced Bāriśa), means rain or rainfall, which is what I think the pattern looks like! At least 225 pairs of denim jeans can be made from one bale of cotton. Authentic blue denim takes its characteristic color from interweaving indigo (blue) and white threads (which I mention in the video!). The term “bull denim” refers to colored/dyed denim. The orange thread traditionally used to sew Levi Strauss blue jeans was intentionally selected to match the copper rivets that doubled the durability of their jeans.